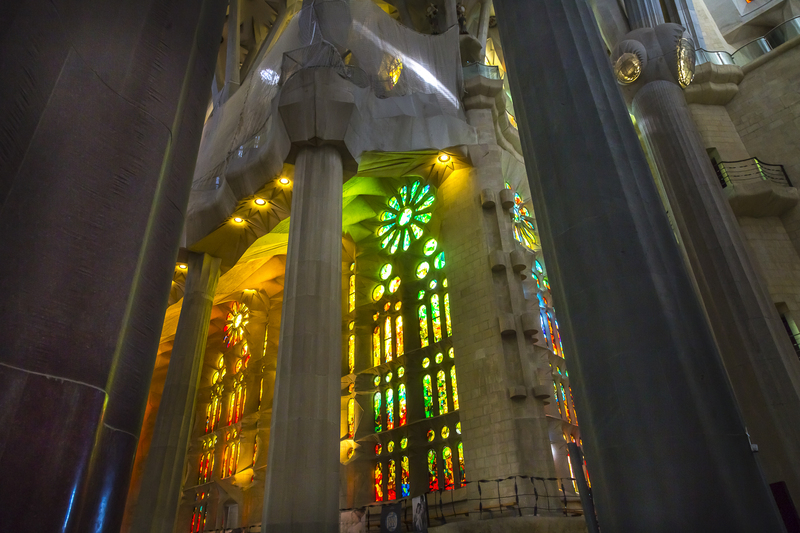 The Basílica i Temple Expiatori de la Sagrada Família is the masterpiece and lifelong project of Catalan architect Antoni Gaudi. 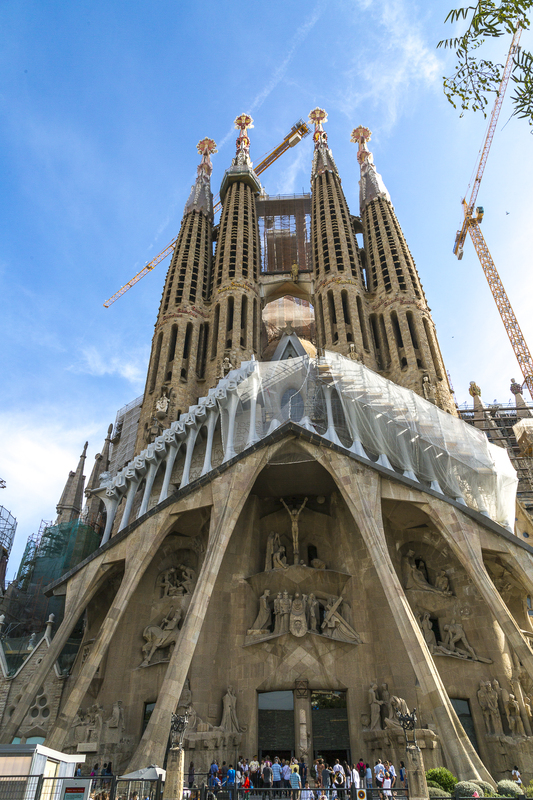 Construction started in 1882 and is expected to be completed in 2026. When you visit the church you can understand why it is taking so long. It is a massive undertaking that is creating an architectural masterpiece. It is very cool to see it being built. 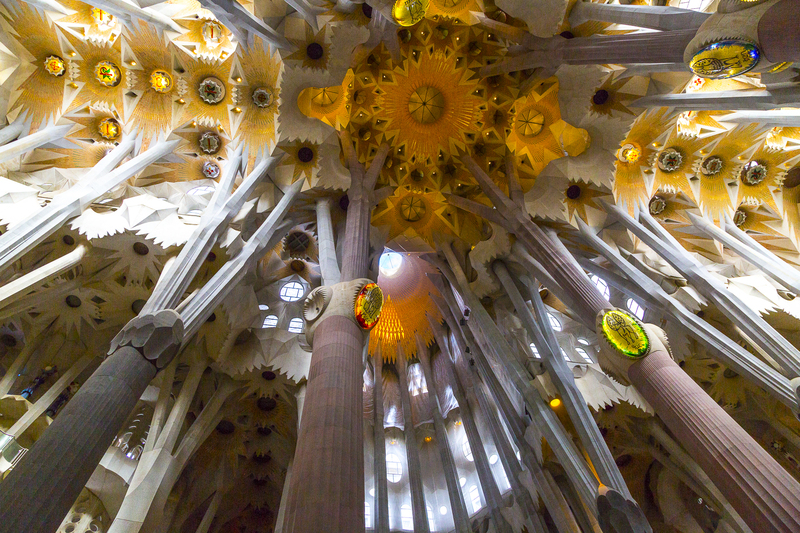 Unlike other churches of this size, Gaudi eschewed the use of the flying buttress (an architectural device used to stabilize the soaring walls of most gothic cathedrals — think Notre Dame in Paris) and uses slightly slanted interior columns like stone trees that bear the weight of the structure. 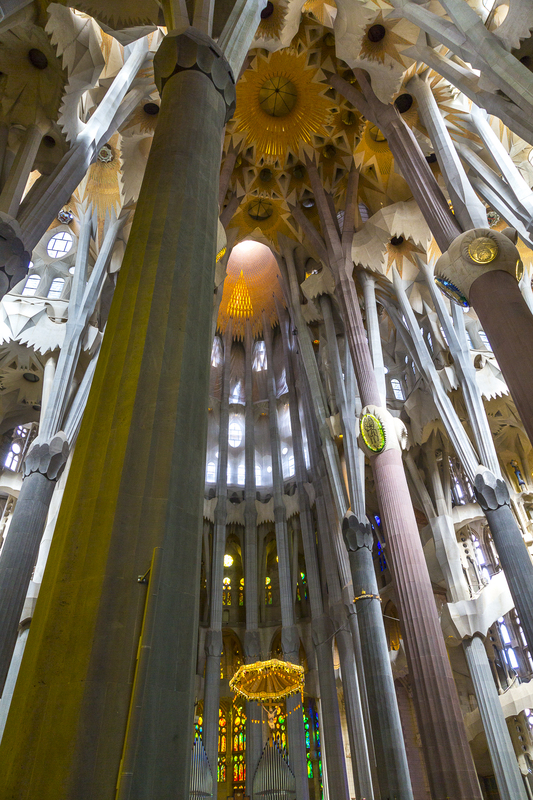 Inside the finished interior sanctuary, the soaring columns give the appearance of a stone forest that supports the roof in the form of dozens of parabolic arches. Natural light entering from the stained glass falls upon the worshipers as sunlight would filter through a forest canopy. The effect is stunning. 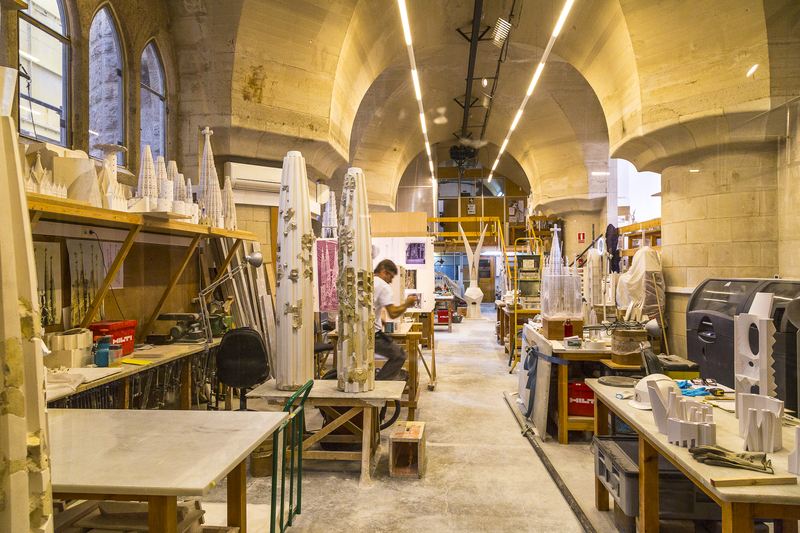 As you wander through the basilica, consecrated by Pope Benedict in 2010, you see work that is ongoing. Kongo viewed stained glass windows that had been added in August. Benches are starting to be placed on the sanctuary floor. Giant cranes lift carved stones in place on the growing towers. Sounds of drills and hammering can be heard everywhere. Above the thousands of visitors that come each day is a bustling construction site. 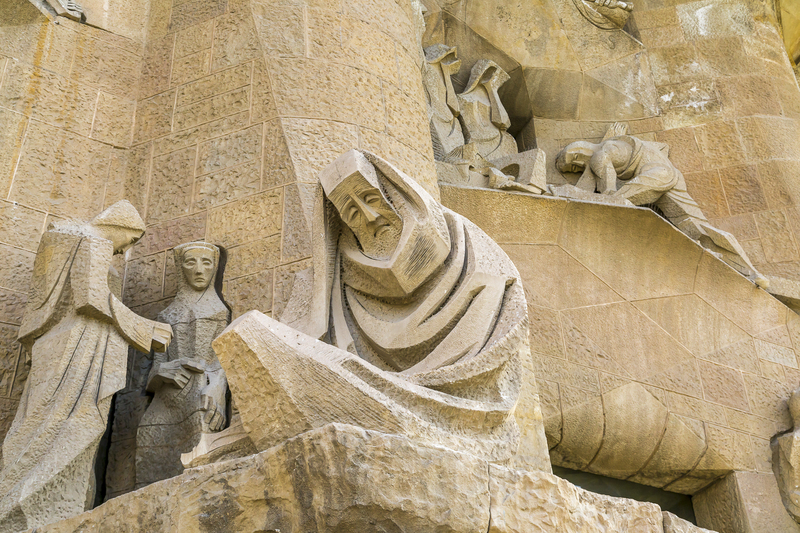 The Sagrada Familia — Holy Family — was intended to be a church for the people. It has always been open throughout its history of construction. 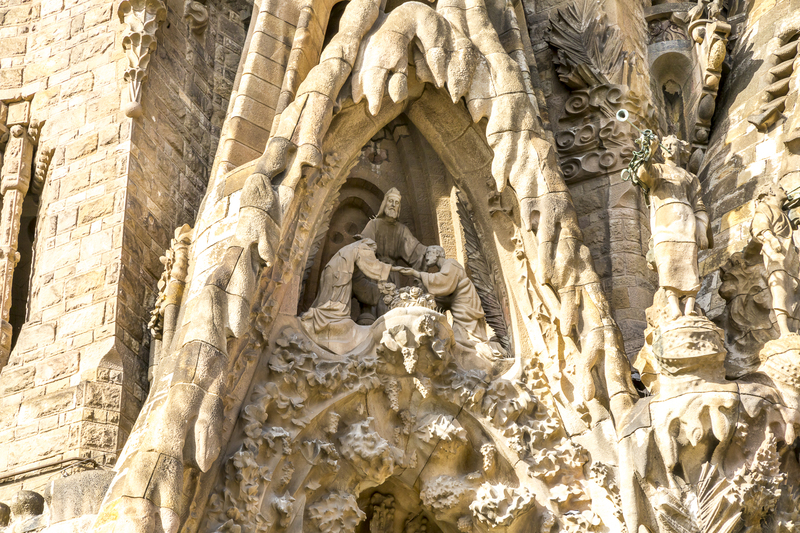 Gaudi drew his inspiration from nature and the outside facade of the basilica is adorned with plants and animals that represent God’s bounty. 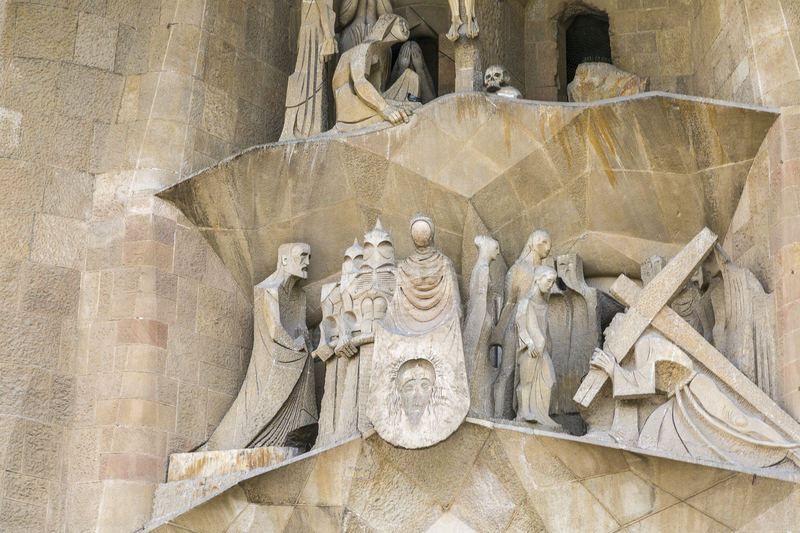 The facade also depicts three fundamental aspects of christianity, the Nativity, the Passion, and the Glory of Jesus’s life on earth. 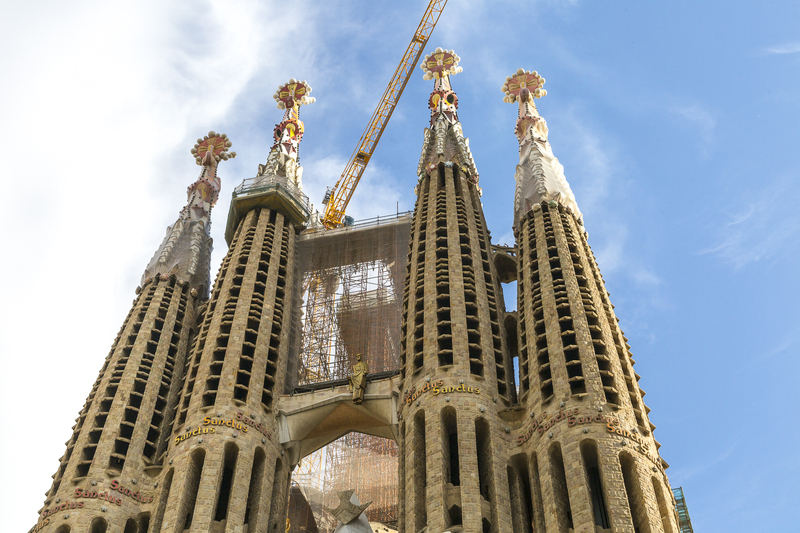 Eventually there will be 18 towering spires, one four each of the Apostles, four for the evangelists, one for the Virgin Mary, and the tallest of all for Jesus. Statues in the face of the facades show scenes from the life of Christ. 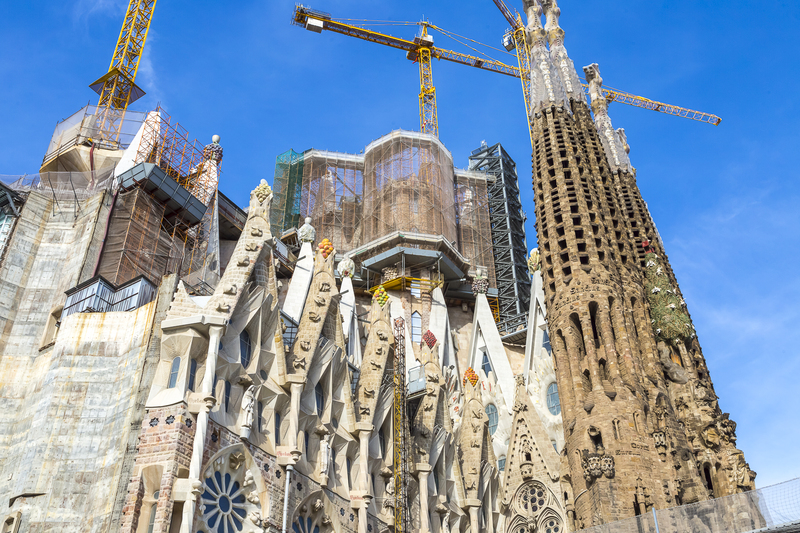 Except for a period during the Spanish Civil War, construction has been ongoing continuously. 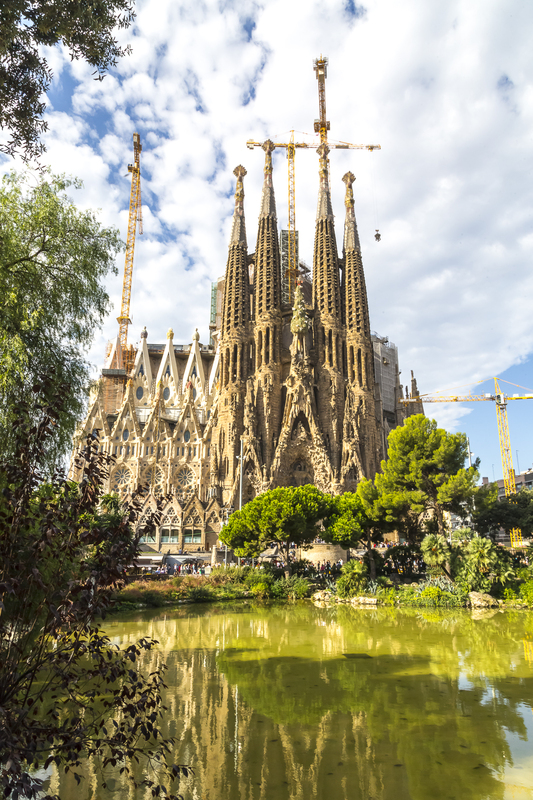 The completion date target of 2026 is planned to coincide with the 100th anniversary of the death of Gaudi, who died in 1926 after he was struck by a tram at the age of 74. 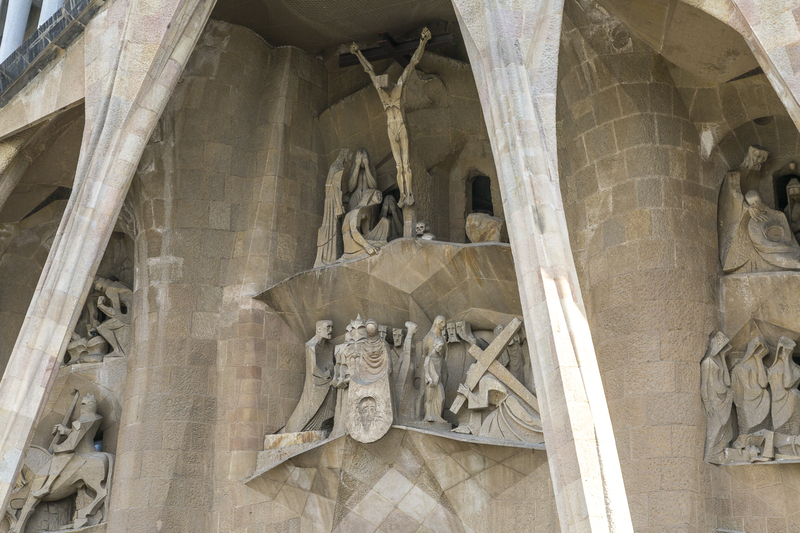 Gaudi is buried in the crypt of the church which is located below the foundation. Antonio Gaudi at the time of his death. 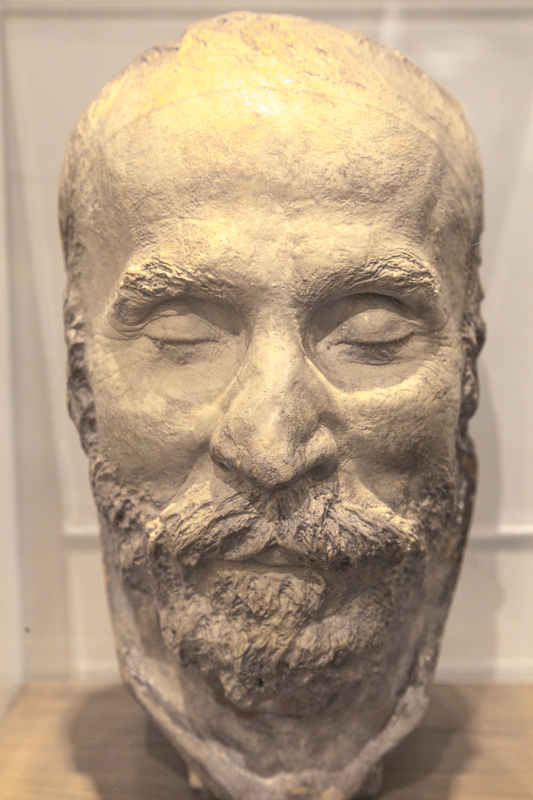 This bust was made from the funeral mask of the architect. 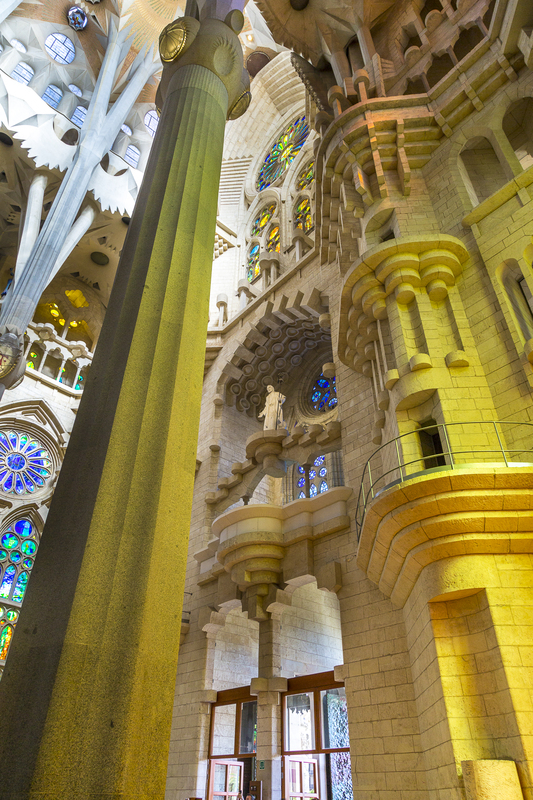 The Sagrada Familia was never intended to be a cathedral, which is the home of a bishop. Instead it was to be a church and basilica. 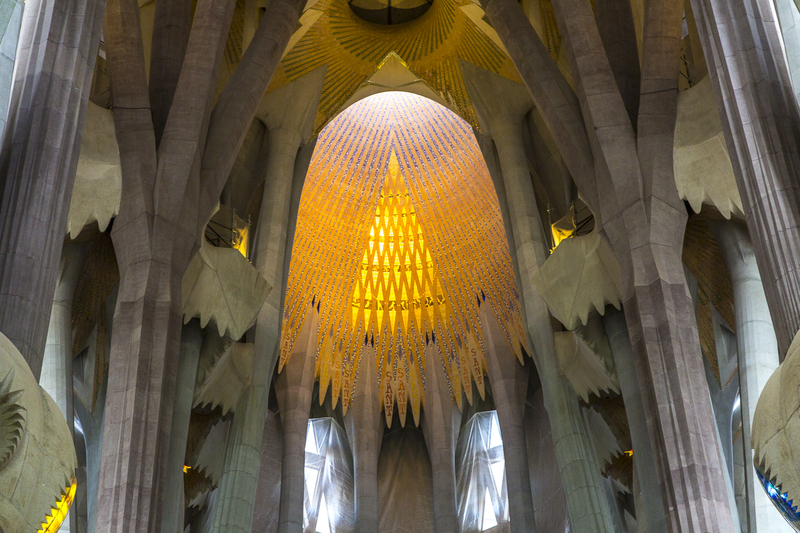 The first mass in the church was not held until 2010 after the pope consecrated the site during a visit to the site. 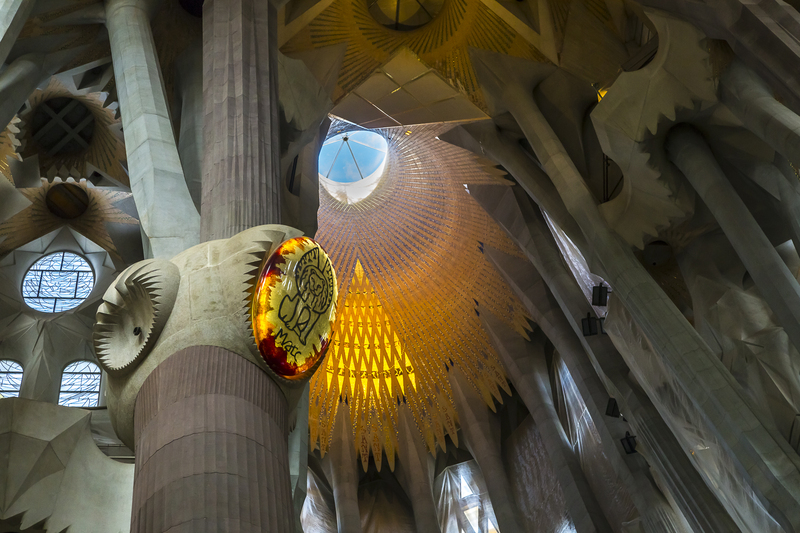 Many of Gaudi’s original drawings and models were destroyed during the Spanish Civil War but modern architects, using computers, 3-D printers, and other techniques have recreated Gauidi’s masterpiece and work continues today with a few additions, such as an elevator that will take visitors to the top of the Jesus spire. 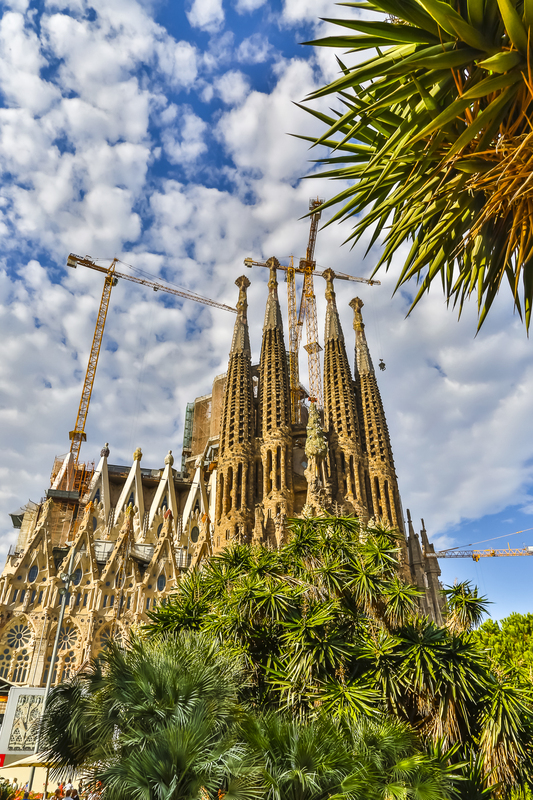 The Sagrada Familia is the most visited site in Spain with more than three million coming each year. Kongo only hopes that he is around for the completion. What an amazing spectacle that will be. Mr. and Mrs. Kongo had a private tour of the site by their wonderful and knowledgable guide, Maria Carmen, who was a wealth of knowledge about the history of the construction and the architect. She made the visit memorable. 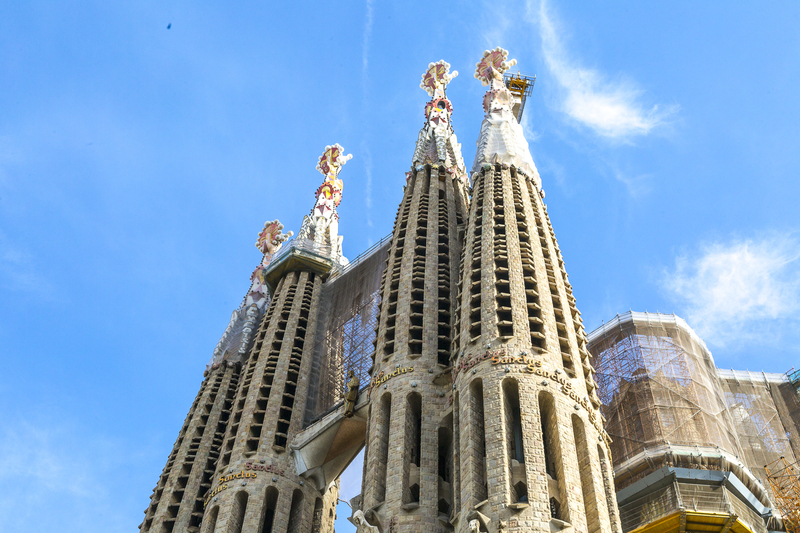 Since 1991 whenever we pass Barcelona we have a stop to visit the Sagrada Familia. We watched the progress over the years. It is the most fantastic place. What a wonderful experience to see it grow over the years. Erin, I hope you get a chance to visit it on your trip. Enjoy Spain! Incredible isn’t it? Without a doubt one of my best Barcelona memories. Great photos! Stunning place and pictures! You captured it beautifully! Got to go there sometime.